For the 1987 Sega Master System version of this game, see Monopoly. 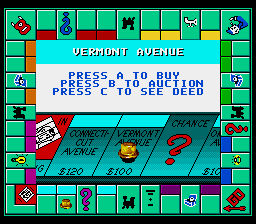 Monopoly is a 1992 conversion of the classic Parker Brothers board game Monopoly by Sculptured Software for the Sega Mega Drive. This conversion of the game features an animated board and movement, along with an interactive bartering system, auction system and property management. However, the conversion lacks the ability to set any of the common "house rules" used when playing the board game, a feature added in later recreations of the game.There is also a version released in 1998 in Russia, however, its release is a secret and it is possible that this is an unofficial version. 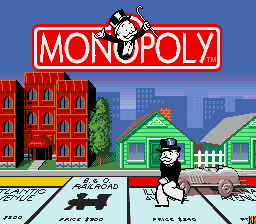 Monopoly is playable by two up to eight players, all of which can be either computer or player-controlled. All the human players can share the same controller if necessary. Each player will be asked to pick from a token: Iron, Shoe, Thimble, Car, Wheelbarrow, Boat, Hat and Dog. It makes no difference which is selected, as the player who starts the game is randomly selected. 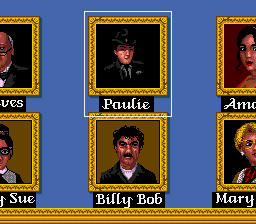 There are eight computer players who may be selected, all of which have identical abilities and skill: Amanda, Mary Anne, Elizabeth, Gary Cant, Jeeves, Betty Sue, Paulie, and Billy Bob. After every player has picked a token, a menu will appear asking to either start the game or configure special options. On the options menu, players may assign different amounts of starting money for other players, to balance out skill. Properties may also be assigned to players. Their token may be placed anywhere on the map also. Houses and hotels can also be placed on properties. The Short Game option allows a time limit to be set, where the player with the most money (combined cash and assets) when time expires wins. There are also a number of preset games available for play, though these have a maximum of four players. A player will randomly be selected to go first. Before a player rolls dice using , any player may hit to bring up a list of options. This list will show that players' assets as well as their cash. Buildings: A player may buy buildings for any properties owned. In order to buy a building, the player must own all properties of that color. There are eight sets of colored properties in the game. A player may build up to four houses on any one property. After that, a player may put a hotel onto that property. Houses and hotels have different prices for different locations on the map. There can never be more than 32 houses or 12 hotels on the board at any time. When a hotel is built, houses are removed. Mortgage: A player may mortgage a property to get some cash quick. A property mortgages for 50% of its normal buying price. To un-mortgage, a player must 55% of the normal buying price. Other players landing on a property which is mortgaged do not pay rent. Trade: Players can bargain properties or money with other players. Computer players do not use this well if they initiate it, often trading their nothing for your something. They will accept most offers, unless it gives you full control of a color. To get full control of a color from a computer player, the person often needs to give it full control, or a load of properties all over the place. Deeds: Shows a list of all the properties, their cost, mortgage value and rent fees. General: This allows you to control the game options, such as game speed and turn order. Mostly an administrative menu. There are 28 properties in Monopoly. Each has a deed which is initially held by the bank. Once purchased via buying or auctioning, the said player assumes control of the property. On land properties, the value of it goes up if there are houses or hotels on it. If a player controls all the properties of any given color, but has no buildings on it, he or she is considered to have a building permit and the standard rent doubles until there is a building placed. Railroads work differently for rent. If a player controls one railroad, the rent is $25. It doubles for each additional railroad that player controls. Utilities work differently, too. The rent is equal to the value of the dice multiplied by 4. If a player controls both utilities, the value on the dice is multiplied by 10. If the player lands on a property, they may elect to buy it for the purchase value. If they do not have enough in cash, other properties may be mortgaged or buildings may be sold in an attempt to get enough money. A player may also elect to auction the property, in which case all players get a chance to bid on it. If the player land on another player's property, they will have to pay them the appropriate rent. The rent level depends on many factors, including the type of property, its location on the board, or how many buildings have been erected on the property. If unable to pay in cash, a player will have a chance to mortgage properties or sell houses/hotels. If still unable, or just unwilling to do that, a player declares bankruptcy and gives whatever properties she or he had to the player who she or he was eliminated by. If the player was eliminated by something else, all property will be auctioned off. Any mortgaged property obtained through eliminating a player must be un-mortgaged before it may collect rent for its new owner. Other than properties, there are many other places a player may land with any roll of the dice. Railroads and utilities work like properties in terms of purchase, though have very different ways of collecting rent. Chance and Community Chests are littered throughout the board; both force a player to draw a card which can have either positive or negative consequences. There is also an income tax square, $200 or 10% of the players total worth, including assets. There is also a set fee of $75 as a luxury tax spot on the board. The corner squares are all unique as well. The starting corner is Go. Anytime a player crosses Go, she or he gets $200 dollars. The next corner clockwise is the Jail. A player passing by is considered just visiting, though players in jail remain there for a while. The Next Corner is Free Parking. In this game, the square is simply a neutral space. The final square is a Go to Jail square. Players going to jail do not collect $200 from passing Go. A player in jail may post bail by pressing on their turn when they are in jail, for $50. They may also use a get out of jail free card, provided they have one. Rolling doubles also gets a person out of jail. On the third turn in jail, a player is released and moves the number of squares as rolled on the dice. Another way to go to jail is by rolling doubles three consecutive times. While in jail, a player can not move, but may still do every other action of the game. Main article: Monopoly (Mega Drive)/Magazine articles.